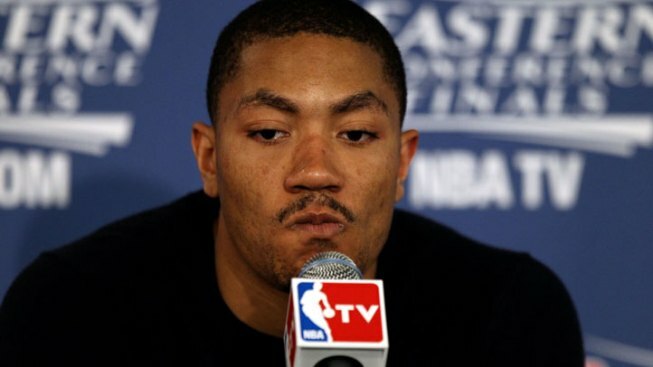 Rose was a passenger in the car of his close friend, Randall Hampton, when Hampton was arrested for a DUI early Friday morning in L.A.
A close friend of Derrick Rose was arrested for a DUI in Los Angeles early Friday while the Bulls guard was riding in the car as a passenger. Randall Hampton was in a black BMW with Rose when police pulled them over at 2 a.m. according to the Chicago Sun-Times. Hampton was arrested after a field sobriety test, while Rose was free to go, according to TMZ which first reported Hampton's arrest. A TMZ video shows Rose waiting in the lobby of a Hollywood police station looking at his cell phone. The videographer asks Rose for comment when he walks outside, but Rose walks right by without saying anything. LAPD confirmed Hampton, 23, was arrested for a misdemeanor DUI by the West Traffic Division officers in Hollywood. Police said he was released at 6:10 a.m. after posting a $5,000 bail.